Washington, DC — February 10, 2017 … US Congressman Lee Zeldin, member of the House Foreign Affairs Committee and co-chair of the House Republican Israel Caucus, was appointed by House Speaker Paul Ryan to serve on the United States Holocaust Memorial Council. The United States Holocaust Memorial Council was established by Congress in 1980 to lead the nation in commemorating the Holocaust. The United States Holocaust Memorial Council consists of 55 members appointed by the President, five members from the U.S. House of Representatives, five members from the U.S. Senate, and three members from the Departments of Education, Interior, and State. Zeldin recently spoke out against President Trump for not mentioning that the Jewish people were the primary victims of the Holocaust. 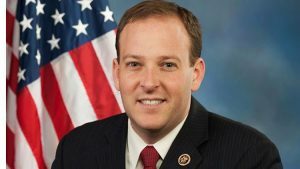 Rep. Zeldin, who represents Long Island, New York, said he believed statements commemorating the Holocaust “should include a reference to Jews specifically as part of the message,” unlike the statement released by President Donald Trump. Trump’s statement on the Holocaust has drawn criticism for omitting reference to six million Jews who were murdered. “The Holocaust was one of the darkest times in our world’s history. Millions of innocent lives were taken, including millions of innocent Jews targeted for who they were. Lee is someone who has consistently shown his commitment to ensuring history never repeats itself—and I am honored to appoint him to the United States Holocaust Memorial Council. As one of two Jewish Republicans in Congress, Lee’s leadership will be an important addition to this group,” said Speaker Paul Ryan.